Hello! My name is Crystal and my mission statement for my life as a whole is: To be a positive force for good in any way I am able. In 2009 I was blessed to be able to combine my personal mission with my passion for all things canine when I took the opportunity to become a professional dog groomer. Since completing my training as a dog groomer I have traveled the United States pursuing another passion of mine, human flight via the sports of skydiving and BASE jumping. Through my travels I have been able to work as a dog groomer in 4 different states, in vet's offices, mom and pop shops, mobile vans, big corporate salons and even my own house call business in Northern Virginia. I have been an employee, a manager, a small business owner and have groomed thousands of pets. I have also had the privilege of teaching two women how to groom and have happily mentored many others. I also donate my services to shelter dogs in need. Needless to say I have learned a lot over the years! 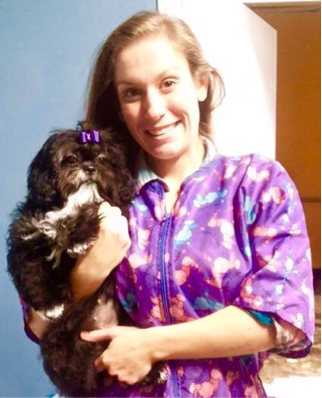 ​Through my current project, Dog Grooming by Crystal, I aim to employ all of the knowledge I have acquired thus far to serve my community through encouraging and strengthening the magical bond shared between humans and canines. Why Dog Grooming by Crystal? I use only gentle handling techniques. I am a cage free facility, which means zero cage time! One of my gifts is that I am an animal communicator. I use only high quality all natural products. I am a low volume salon, which means focused individualized attention, less noise and little to no stress. I am a happy, calm, kind, compassionate and loving person. I am passionate about dogs and it shows. I am a dog nerd. I take my responsibility to my clients, who I consider family, seriously!